OnePlus recently released the Oxygen OS 3.5.5 for the OnePlus 2 device. The update was a huge jump from the previous OOS 3.1.1. A great effort from the One Plus development team. However, the update caused some network and VOLTE issues. Some of the users also complained about the second SIM not working and that the IMEI for SIM 2 shows null. Now the development team has released a Hotfix update for these issues. The Oxygen OS 3.5.6 fixes some network related glitches. The OTA update is now live in many parts of the globe but not yet live in India and Asian countries at the moment. However, we have managed to capture the signed OTA update zip file that will take your OnePlus 2 from Oxygen OS 3.5.5 to OOS 3.5.6. So hit the download section below and grab the OTA right now. What’s new with Oxygen OS 3.5.6 for OnePlus 2? How to Root Oxygen OS Marshmallow and Install TWRP? 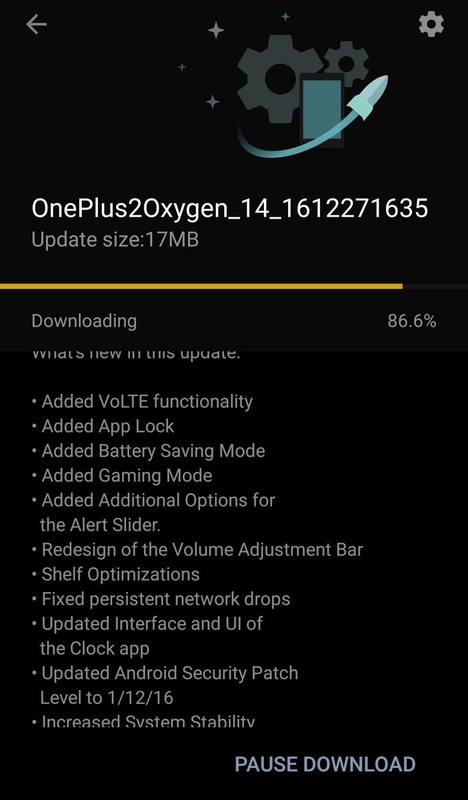 How to update OnePlus 2 to Oxygen OS 3.5.6 from OOS 3.5.5? 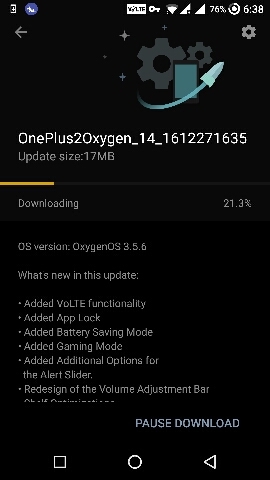 If you are already on the official Oxygen OS 3.5.5 then all you need to do is flash the OTA patch listed above for the Oxygen OS 3.5.6. However, if you have not yet updated and still on the Oxygen OS 3.1.1/3.1.0, then all you need to do is get the official OTA update notification. 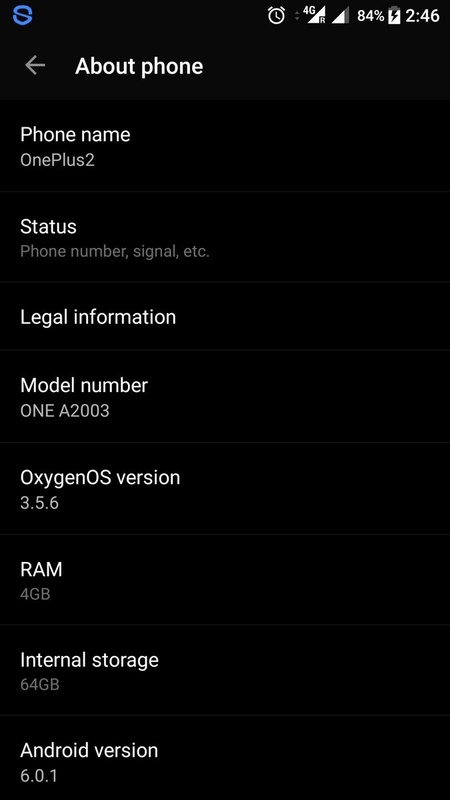 How to get OTA update notification for OnePlus 2 for Oxygen OS 3.5.6? Download and install the Opera VPN or any VPN app on your Android. Once connected, change the region to Canada or Germany. Now go to Settings > System Updates and check for any updates. You will get an OTA update notification for the Oxygen OS 3.5.6. Download it and update via stock recovery. Depending on what Oxygen OS version you are on, the update file size may change. For OOS 3.5.5 it should be around 17 MB update. For rooted users with TWRP recovery setup, you can download and flash the full ROM zip file. Dirty flash can be acceptable. Meaning, without wiping data. Non-rooted users with stock recovery can simply grab the small OTA file and install it by rebooting into stock recovery and also via ADB sideload method. Check out all the procedures on this page for OnePlus 2(Oxygen OS 3.5.5) or you can make use of the OnePlus 3 post as well. To downgrade from 3.5.6 to previous stable one, you can download the OnePlus 2 OxygenOS 3.1.1 Special Intermittent Version. See more details on the OnePlus support page. Like, share, and follow us on social media. For queries, comment down below. Successfully deployed 3.5.6. No network drop as of now but can still see data drop (especially for JIO network) & I still can’t see VOLTE enabled. Looks like this needs another update. same here. no network drop, but data drop after restart, which lasts for a while, and then becomes fine over a span of time. also no VOLTE. Previous Entry 5 ways to keep your Google Account safe – How to Secure Gmail and Google Account?